Working in the Public Interest is a student-run conference at the UGA School of Law. Every spring public interest law students bring practitioners from around the world to Athens, Georgia to speak about pressing issues of the day in public interest law. The purpose of WIPI is to create a forum where public interest law students can bring the issues that matter to them to the table. Attendees of the conference are given great networking opportunities with professionals in various fields of public interest law. WIPI seeks to bring together eminent practitioners in their respective fields, students, and faculty to discuss practical approaches to lawyering that promote social justice and human rights for all. The Conference seeks to highlight dynamic, creative ways to combat social injustice through advocacy and the law. 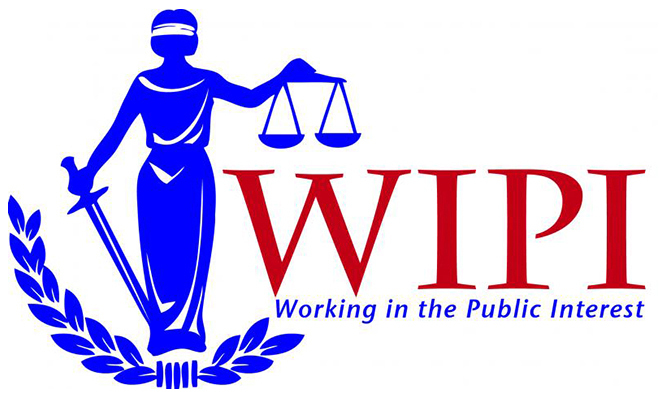 The 14th Annual Working in the Public Interest (WIPI) conference will focus on the immigration system, the veterans' administration, and the intersection of immigrant and veteran rights. This year, WIPI conference is working in collaboration with the commenuity to provide a more holistic, contextual approach to systemic problems within our community. The event is $5 for UGA students and Staff, $25 for Community members or UGA faculty seeking continuing education credits, $50 for Social Workers seeking CEUs, $75 for UGA Law alumni seeking CLE credit, and $100 for all other attorneys seeking CLE credit. For attorneys, five hours of continuing legal education credits are available. For social workers, five hours continuing education units are available. Working in the Public Interest Conference is committed to reducing access barriers. Please contact Dana Leader at dleader@uga.edu regarding scholarships for community members and students at least three days prior to the event. We are committed to providing reasonable access and accommodations for people with disabilities upon request. For questions, contact Casey Anne Graham at casey.graham@uga.edu or 706-542-5167 at least three days prior to the event. A discussion of the unique challenges lawyers face as well as how having no constitutional right to an attorney impacts clients. Georgia does not allow Dreamers to attend public colleges. How does this affect the immigrant community and how can citizens advocate for changes to this policy? Historically, military service has been a pathway to citizen in the United States. With new regulations in place, this is no longer the case and many veterans are finding themselves deported upon completion of their military service. The WIPI Conference was founded by UGA Law Students in 2005. Kelly James, Rakesh Parekh, Heidi Taylor, and Vanessa Volz teamed up to develop a conference proposal. Dean Rebecca H. White of the UGA School of Law graciously offered to support the endeavor and WIPI was born. The first annual WIPI Conference was held in April of 2006, and former Senator John Edwards served as the inaugural keynote speaker. In 2007, the WIPI Executive Board established the Milner S. Ball Lifetime Achievement Award to honor practitioners that have dedicated their careers to public interest work. The award is named for Professor Ball, who founded UGA's Public Interest Practicum and inspired many UGA students to pursue their interests in public interest law. The WIPI Executive board also created the WIPI Student Achievement Award to honor law students who, through their work in public interest, made a significant difference in the lives of the indigent or under-served. Candidates for the award should be current law students, who did not receive compensation or monetary reward for their efforts. Work performed in clinics, internships, and externship for class credit is acceptable. 2009 - Rebecca Williford, 3L, University of North Carolina, President of Disability Law Association.